These fundamentals originated from the great teaching of Sri T. Krishnamacharya manifesting in a truly splendid expression through B.K.S Iyengar. Iyengar in his 75th birthday teachings mentioned fundamentals that stem from Tadasana (the Mountain Pose) and hinted at the ability to attain ultimate states in the Yoga poses. These were states of samadhi. In the practice of Yoga in the essence of life. Let us begin with the basics and then later approach the subject of illumination. 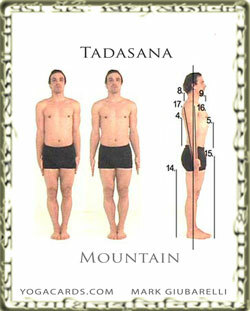 Tadasana shown above has many basic points that can be referenced in other yoga poses. These points originate from the toes and feet all the way to the top of the head. The foundation of a tree is its roots therefore bring awareness to the feet first in this yoga pose. The same force should be present in both feet. Pelvic adjustments must be made to achieve this. Evenly distribute the weight over the feet. Always try to get more of the surface area of both feet and toes to touch the floor. The toes should be used to stabilize the body from forward motions. Sometimes the weight can fall on the outside or inside of the feet. Try to have the weight centered. Breathing and the element of air cause the body and its earth to shift. The center of balance is shifted depending on how well we breathe. Master breathing and its effects so that the body remains in alignment. Make sure the head and neck are aligned well look at numbers six, seven eight, nine on the image above. Make sure that the neck is not tilted forward too much. Also be aware of the length along the sides of the neck. although this seems easy in the standing pose above you will find that one side becomes short often when the head turns and the neck is twisted.